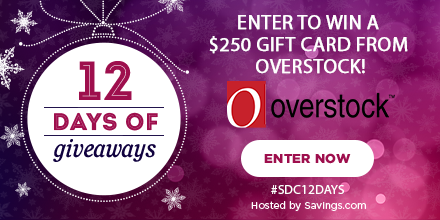 12 Days of Giveaways Day 5: Win a $250 Overstock Gift Card! This entry was posted in ARCHIVE and tagged Giveaways, Overstock, SavingsAplenty, SDC12Days. ← FlavorQuik Immersion Blender 12 Piece Combo Set ONLY 22.49 Shipped!